Fred Van Lente brings us this tale of Peter Parker’s exploits with the town baseball squad, which reads more like an after-school special than a costumed adventure. On one hand, that’s to be expected: the Marvel Adventures line is targeted to kids, ultimately hoping to interest young readers in the themes that make their greatest characters tick without bogging them down with years of continuity. On the other: kids aren’t dumb, and they can tell the difference between good writing and a cluster of stereotypes. Van Lente makes a few efforts to introduce some flavor to the proceedings (Flash Thompson cursing Peter for being a nerd, then processing some simple physics before hurling a baseball at Parker’s head) but for the most part it’s just a cookie-cutter story crammed into a kid-friendly package. 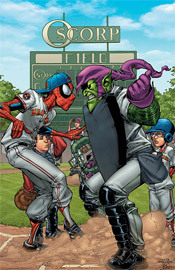 While there’s a small side story featuring Spidey and the Green Goblin, the majority of the issue focuses on Peter’s exploits with the baseball team and his moral decision between using his powers for profit and retaining his secret identity. It seems like every super-powered character has faced this dilemma in the past, so it’s far from fresh material, and the feel-good nature of the way it plays out is over-the-top and cheesy. Pete never seems like the bright young kid he’s always been, he feels more like a weak-minded character who falls into a solution at the end of the issue that sends everyone home happy. Cory Hamscher’s artwork is suitable to the simple, cartoony nature of these titles. His clean, gestural style is a good match for the light tone of this story, and he gives each character a look and feel all their own. Peter, for instance, really looks and acts like a skinny nerd throughout the issue. That’s something that a lot of artists overlook with the character, that deep down inside he’s just a goofy kid with glasses and a passion for learning. When Hamscher shines, he does so brightly – his take on the Green Goblin, who appears sporadically throughout the issue, is outstanding. He mixes in elements of other characters (The Joker’s smile, Captain America’s chain mail) but does so inventively without losing the little touches that make the Goblin unique. But when he shows signs of laziness and loses interest, his work fades fast. Every single character in this book has an enormous, toothy grin – even when one isn’t appropriate. He has no passion for the conversational scene between Harry Osborn and his dad, so the book feels incredibly disjointed when their chat is treated like an afterthought, but the Goblin’s appearance further down the same page is given a wealth of attention. Ultimately, this is what you’d expect it to be. It’s not charting any new territory or revealing anything new about the characters. If anything, it’s undoing a lot of the good in them by overly simplifying things to fit into a single issue. The artwork is just acceptable, the story could have written itself, and it’s really nothing more than a bunch of fluff meant to fill space and maybe occupy the reader for ten minutes. Skip this, unless you need to pad your collection.